Sudden Death is bone-breaking, pulse-pounding expansion for Blood Bowl: Team Manager – The Card Game that brings three new teams, new Contract payouts, new enchanted balls, and more! Enhance existing teams with additional Staff Upgrade cards and Team Upgrade Cards, and take the competition to new heights with never-before-seen Highlights and Spike! Magazine Cards. Meanwhile, all-new mechanics like enchanted balls and contracts provide a variety of new strategies. With all this, the Sudden Death expansion is sure to raise your spirits...and maybe a few others. Sudden Death introduces three new teams to the skull-crunching action; the Dark Sorcery Syndicate union features dabblers in forbidden magics who just don’t know when to stay down. The undead Champions of Death tear up the pitch – sometimes literally as they raise new zombies and skeletons from the corpses of former Blood Bowl players. The vampires of the Black Fangs are always thirsty for victory (and blood). And the Dark Elves of the Naggaroth Nightmares are happy to give both teams plenty of fresh corpses with which to play. Sudden Death also introduces exciting new mechanics that expand the game’s strategic options. Contract tokens are a reward that let managers gain fans in whole new way. 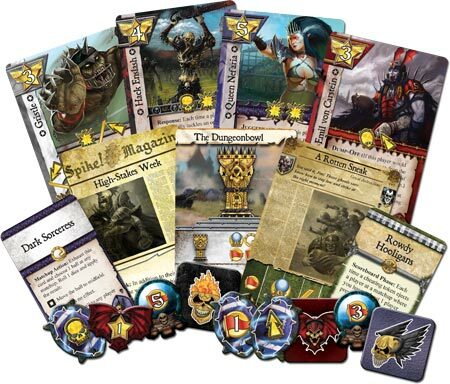 Managers earn these tokens by competing for Highlight and Tournament cards that feature the Cabalvision Contract icon, and each token provides a different number of fans. A cracking FFG card game (not an LCG) and another brilliant example of how FFG use the Games Workshop IP better than GW!!!!!!! If you don’t know what BB is, it’s basically Rugby/American Football in the Warhammer Fantasy World. Sudden Death includes 3 new teams (dark Elf, Undead & Vampires), a host of new star players, team & staff upgrades and new tournaments. So in a game of BBTM, you start with a basic team at the beginning of the season, you then play in highlights (games) where you can pick 1 of 5 to play in so you might end up playing in 2 or 3 highlights. On each side of the highlight is a reward for winning and in the middle is the reward for the winner so even if you don’t win, you will still get something. To win the game overall, you need to have the most fans so you need to look to get as many of these are you can. Another huge reason to pick the highlights you want to take part in is star players. If you win them, you add them to your deck and the game takes a deck building slant which really increases your options. The game overall embodies the total chaos and fun of the BB universe. It’s great fun and you get stuck in and the game builds towards the end of the season and The Blood Bowl cup itself. It’s manic, bloodthirsty and totally nuts especially when you thing you have a highlight won only to have a player sent off and your opponent steals in for the win. Social Inclusion… While BBTM is loads of fun and not a difficult game to learn and play, would my wife play it??? No, I don’t think she would. However, if you a non gamer who was up for a new gaming experiences, this would be a good starting play. Analysis Paralysis… This is not a major factor in the game. It only might creep in the end game but it’s not enough of an issue to switch me off. Add a Review for "Blood Bowl: Team Manager – Sudden Death"